Oops - we don't appear to have a video for the DR-2510C. Does what it says on the tin, easy to use , fast and excellent quality, set up and use in 2 mins, has reduced paperwork in the office and essential piece of kit, powerful unit for something so small. Small machine that sits on the corner of the desk in sleep mode, and then whenever I want multiple or single pages it gets into action quickly. Good quality, although I haven't managed to get the feature that corrects the orientation of the page (if its slightly skewed) working. Overall, very pleased. The DR-2510C is a compact workgroup scanner that delivers high levels of performance, ideal for workgroup environments and distributed scanning applications. This productive scanner is simple to operate and ensures all your scanning tasks can be completed effortlessly and without delay. With a footprint measuring just 298 (W) x 160 (D) x 160 (H), the DR-2510C is one of the smallest and lightest scanners in its class. Perfect for placing on the corner of a desk or neatly on a small cabinet. 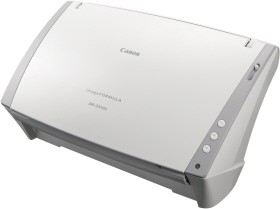 Utilising Canon's new innovative CIS Sensor, the DR-2510C document scanner delivers the same highly productive speeds whether scanning black-and-white, greyscale or colour documents. So you can expect a productive 25 ppm or 50 ipm for double-sided documents. Whatever you need to scan ? from poor quality NCR paper to feint coloured text documents with dark detailed backgrounds, the DR-2510C, with an optical resolution of 600 dpi, delivers exceptional results. An outstanding range of image processing features are available including Advanced Text Enhancement, Moiré Reduction and Prevent Bleed Through all ensuring high quality images and maximum legibility. Three programmable Job Buttons makes operation simple meaning tasks such as scan-to-email and scan-to-file can be effortlessly carried out without any additional software and just with the ?touch of a button. A slanted paper path is employed which ensures optimum feed reliability, from thin to thick and embossed media including business cards, ID cards (i.e. driving licenses), photographs and A3 documents (in folio mode). On the DR-2510C, an ultrasonic double-feed detection system helps ensure that feed problems are quickly identified and automatically rectified. What's more with Auto Page Size Detection and Deskew you get perfectly cropped and straightened images. Canon's versatile Capture Perfect scanning software is included for added flexibility as well as tools such as Adobe Acrobat 8, Nuance Omnipage SE, Scansoft Paperport SE and Presto! Bizcard Reader 5 SE.